Blue Sky’s Chileno Bay snorkel tour takes you to one of the epi-centers of snorkeling. Its clean, golden-sand beach is great for both beaching and snorkeling. What’s the best time to book your Chileno Bay snorkel tour aboard one of Blue Sky’s yachts? It’s not a bad idea to get there earlier in the morning since Chileno Bay is a local, hot spot. Some guests choose earlier in the day, in order to rest up and catch Cabo’s famous night life later. Other guests choose to book their Chileno Bay snorkel tour later in the day so they can spend part of the time in the water and the other half of the time aboard the yacht, enjoying the Sea of Cortez and the many costal sights. A late afternoon Chileno Bay snorkel tour could also include watching the spectacular sunsets as you are lulled by the motion of the waves while aboard the boat, sipping your favorite cocktail. Your Chileno Bay snorkel tour starts on board one of the Blue Sky’s luxurious yachts. We’ll cruise along the Lands End peninsula and El Arco (The Arch), past Lovers’ Beach and straight to the famous Cabo Arch where a colony of celebrity sea lions lives. You may get lucky to meet “Poncho” on your return from your Chileno Bay snorkel tour. And, it’s not a complete Chileno Bay snorkel tour if you don’t get a fabulous photo of you and your group in front of El Arco. As we cruise past famous Cabo San Lucas landmarks such as El Arco, you will see the sea lion colony, hidden coves and beaches on your way to have the experience of your life with the ultimate Chileno Bay Snorkel tour. At Land’s End, the seal lions will greet you with loud barks as they swim and play in the water. And you’ll view pelicans roost on famous Pelican Rock. The Pacific Ocean meets the Sea of Cortez here at “Lands End”. Aquatic life in between oceans travel here to dine on the nutrient rich water so even as your Chileno Bay snorkel tour hangs out close to the reefs, we frequently encounter all kinds of fish and mammals. Humpback whales have been known to swim up to the entrance of Marina in Cabo and follow the boats along their ocean cruises! Whale season ends in April, but don’t worry you may see dolphins and skate breaking the ocean waves as we depart Cabo for Chileno Bay! We will cruise past the Arch on our way North to Santa Maria Bay, drop anchor at this spectacular location where you’ll swim, snorkel and have time to relax as part of your Chileno Bay snorkel tour. The Los Cabos area is home to an amazing variety of fish life. 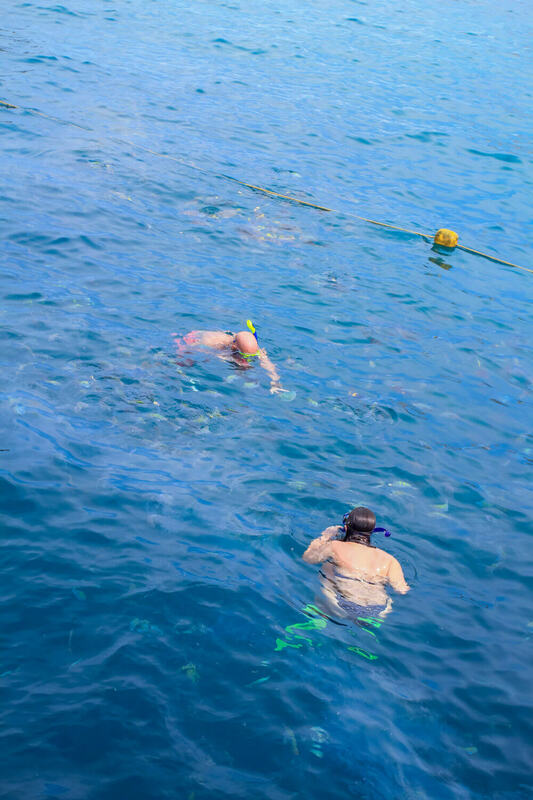 The water is clear, and as well as lots of reef fish, you may spot sea cucumbers, sea urchins, sea stars, crabs, sting rays schooling mobula rays, turtles, along with sea lions and pelagic fishes. There are usually lots of colorful tropical fish here too. You will find the usual tropical fish families such as: Angel fish, tangs, puffer fish, porcupine fish, trumpet fish, damsels, butterfly fish, wrasse and many, many more. And don’t forget to make a wish if you see the occasion Star fish during your Chileno Bay snorkel tour. Before hitting the water, you will receive an instructional briefing concerning basic boat safety, in and out of the water. Be sure to bring a waterproof camera, sunglasses, swimwear, non-slip shoes, towels and sunscreen. We suggest water proof sunscreen like BullFrog, that stays on all day. When you embarking on your Chileno Bay snorkel tour and cruise, typically flippers, masks, snorkels and life jackets will be provided. You are welcome to bring your own gear too. You may be required to wear a life jacket at all times, even if you’re an experienced swimmer, depending on the tides and undertow. Your Chileno Bay snorkel tour should be a stress free experience and life jackets can give you peace of mind, especially for people who are not strong swimmers or for first-time snorkelers. The area has three beaches where you can snorkel with corals and a wide range of tropical fish. Have the crew toss you a beer as you lounge in the sunshine afloat a Lily Pad, a large floating raft that can accommodate you and several of your friends. Our crew will gladly snap photos of you and your group throughout the day while you are enjoying your Chileno Bay snorkel tour.